Finding the right lighting solution for your home or workspace may seem like an overwhelming task when you first start planning. The lighting in your home should be both aesthetically pleasing and functional, fit your style and individuality, and produce a comfortable and productive environment in your home. Our commitment to you is to help you find the right solution for your lighting needs. To that end, we are confident that our lighting showroom will be a helpful tool for you to use to accomplish that goal. Please use our knowledgeable staff as your resource to learn more about lighting styles and techniques that will make your next project a success. In the meantime, here are a few lighting concepts that will help get you started. Perhaps the most fundamental concept to understand when planning the lighting for your home is the layering of light. In most spaces in your home, having three layers of light—ambient, task, and accent—will help you achieve proper balance between aesthetics and function with your lighting design. 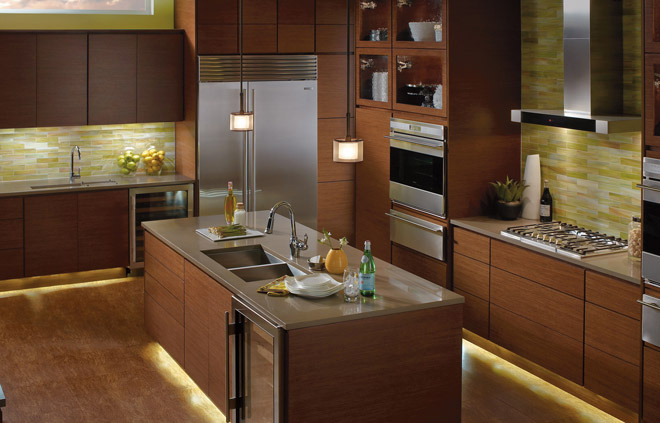 This kitchen provides an excellent example of laying the 3 types of lighting. The pendants over the island provide ambient or general lighting for the room. The under cabinet lighting and lighting in the vent hood over the stove provide task lighting, while the linear lighting in the toe space under the cabinetry provides a nice layer of accent lighting. Ambient lighting, also referred to as general lighting, is usually the primary source of lighting in a room. This will typically be a decorative lighting fixture such as a chandelier, a surface mounted fluorescent fixture, or recessed down lighting (“recess cans”). Task lighting provides focused or concentrated illumination to assist in performing specific tasks and takes on different forms depending on the room and use. In a living room, for example, this could be a table lamp, while in your kitchen the under counter lighting is your task lighting. Accent lighting is used to fill out a space by highlighting architectural features or bring attention to objects in room or on the walls. Low voltage recessed down lighting, track lighting, monorail systems, and other low voltage lighting solutions are well adapted for accent lighting. To learn more about the three layers of light, visit the American Lighting Association website. Understanding the key features of different light sources will help you make more educated decisions about the lighting for your home. Are you familiar with the difference between incandescent, fluorescent, light emitting diode (LED), and high intensity discharge (HID) light sources? For an excellent overview of these types of light sources, please visit the American Lighting Association website. Taking into account the three different types of lighting in your home—ambient, task, and accent—will help you chose the right type of lighting fixture for any space. 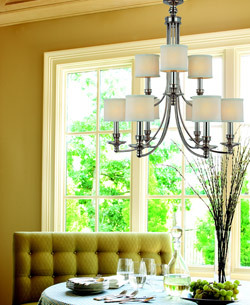 Decorative fixtures such as chandeliers and ceiling mounts make excellent sources of ambient or general lighting. Track lighting, monorail systems, table and floor lamps, and under cabinet lighting provide task lighting and sometimes accent lighting as well. Other sources of accent lighting include low voltage linear lighting systems, LED tape and rope lighting. To learn more about the different types of lighting fixtures and their uses, please visit the American Lighting Association website and/or Kichler Lighting’s website. This excellent resource from Hinkley Lighting illustrates basic lighting concepts and terms that will help you make smart lighting selections for your home. Need help getting started with your lighting design? Check out some of these great resources we have gathered from our manufacturers, the American Lighting Association, and other online sources.